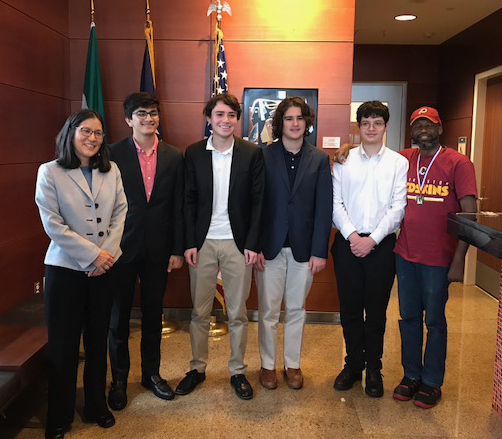 Catlin Gabel students at the U.S. Embassy in Equatorial Guinea: From left: Ambassador Julie Furuta-Toy; Avi Gupta '19; Seth Talyansky '19; Sean Uan-Zo-li '21; Duncan Soiffer '20; and Technical Director of the National Chess Association Federico Elé Rano. Photo credit: Public Affairs Officer Brian Schiller of the US Embassy. See the trip blog for photos and the day-by-day narrative. See the Executive Summary detailing meetings, chess events, media interviews, and more. November 16, 2018 - Four Catlin Gabel Upper School students have traveled to the Central African nation of Equatorial Guinea to work directly with students and teachers in promoting cross-cultural understanding through chess education and competitive play. The trip, taking place November 15-21, is the culmination of a two-year collaboration with Equatoguinean chess activists. The cross-cultural exchange was initiated by the students after they made contact with educators and chess enthusiasts in Equatorial Guinea and learned of the obstacles faced by young players. The four students traveling to Equatorial Guinea are Avi Gupta '19, Seth Talyansky '19, Duncan Soiffer '20, and Sean Uan-Zo-li '21. Their efforts over the past two years have been a collaboration with la Asociación Nacional de Ajedrez de Guinea Ecuatorial (ANAGE). On their trip, the four will work directly with ANAGE Technical Director Federico Ele Rano and his team to organize a chess festival that will include a youth tournament and the inaugural international Equatoguinean Open. They also plan to continue their effort to promote chess education in schools. Various national chess federations have backed the project, including those of the United States, Spain, and Brazil. The Oregon Scholastic Chess Federation (OSCF) and the Washington Chess Federation (WCF) have also contributed chess supplies for donation to Equatoguinean schools. The trip to Equatorial Guinea is the culmination of years of work by Avi and Seth to promote chess locally, nationally, and internationally. As leaders of the Catlin Gabel Chess Club, they launched the Catlin Gabel Chess Festival in 2016, an open all-ages competition that initially drew 123 players from 30 area schools. Since the inaugural Festival, Duncan and Sean have been substantially involved in Festival planning and execution. In 2018 the Festival attracted 150 players from across Oregon and Southwestern Washington, including a delegation of first-time competitors from Hermiston, Oregon. Festival proceeds have gone toward numerous charitable causes, including a donation to the Portland Rescue Mission, and initiatives to support chess in Macedonia, Guatemala, and Equatorial Guinea. The students’ collaboration with chess players and educators in Equatorial Guinea began in 2016 when Seth contacted the country's embassy in Washington, D.C., as a project for his Spanish class (Equatorial Guinea is the only Spanish-speaking country in Africa). Through the embassy’s consular secretary, Seth and Avi were introduced to Federico Ele Rano, who would become their partner in Equatorial Guinea. Working with Ele Rano, the students have coordinated correspondence games with Equatoguinean players over email and WhatsApp; offered guidance on forming and operating a chess club; and shipped chess materials to their counterparts, including chess sets, clocks, and books. You may follow their daily progress on the trip blog here.